If you have a little girl that is at that special dress up age, you will want to check out the tutorial for these princess play aprons. We had a entire chest full of dresses and if I had it all to do over again I would opt for the aprons. There are a lot of reasons I feel this way. They will not out grown them as quickly, they are easier for them to get on by themselves, and they are less likely to strip down to their undies when changing into them. The rule in our house is you have to keep your clothes on under dress up clothes! This is a really important rule if you have a lot of play dates! Either way, these aprons are beyond cute, and looking at the tutorial I might actually be able to pull them off. Too bad all of my little girls are past the stage where dress up take most of their day. 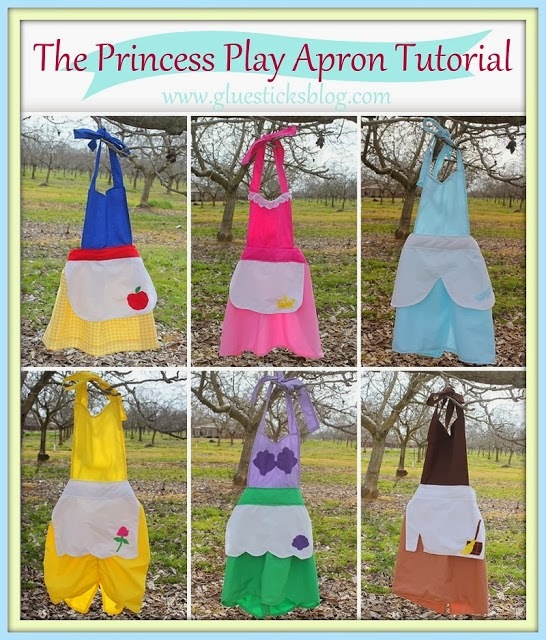 You can check out the 6-in-1 Princess Play Apron tutorial over at Gluesticks.